Also, the one way you should never do it. 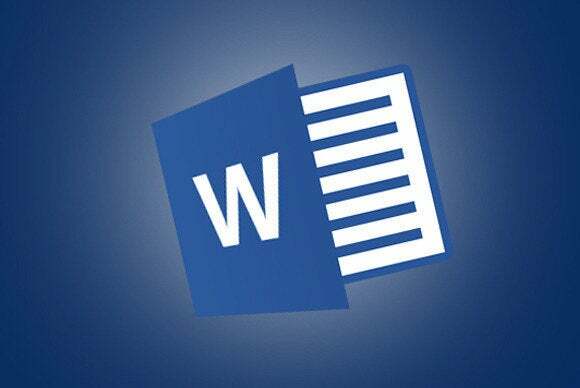 Extracting images from Microsoft Word has never been an easy task because Word compresses images (sometimes to as low as 72 dpi) to save memory and keep file sizes small. You can disable the Automatic Picture Compression feature, if you’re the document’s owner, but this step must be performed before the images are inserted. Also, it’s just one of the many steps required to fix this defect. For example, you cannot just copy and paste from Word to other programs such as Photoshop or Paint Shop Pro and retain a quality image. Some workarounds result in blurry, pixelated images at lower resolutions. Most of the following workarounds provide acceptable results, and the last one offers close-to-the-original results. Start by opening a blank Word document. Select Insert > Picture, navigate to an image folder, choose an appropriate image (select a 300-dpi image that’s over 2MB), then click Insert. Note the file size of your original file. The original image we’re using is 6.85MB. It’s easy to extract an image from Word using Save as Picture, but the saved image will not be the exact same file as the original. 1. After selecting Save as Picture, navigate to the appropriate folder, enter a filename, then click Save. 2. 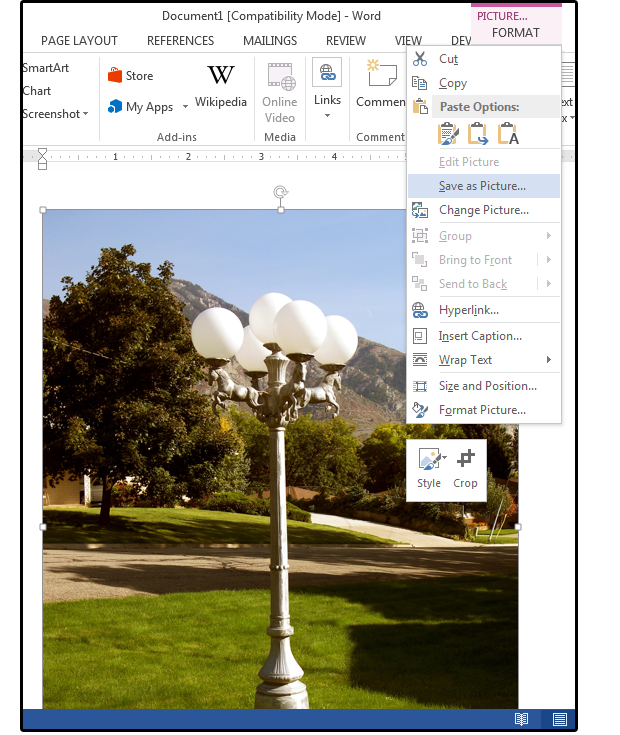 Launch a graphics program, such as Photoshop, and open the original image that you inserted into your Word file. Next, open your saved file. 3. 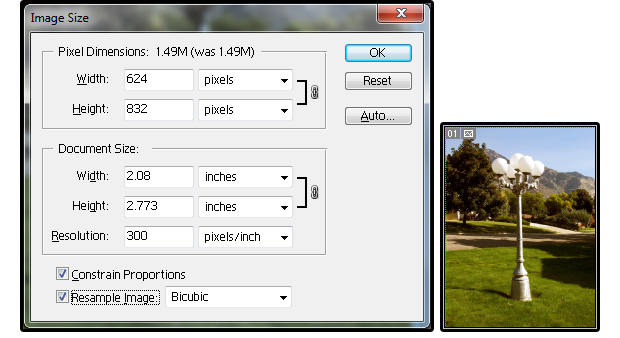 The original image is 300 dpi and the file size (as noted above) is 6.85MB. The image size is 8.16 x 10.88 inches. The original image has a large file size and a large image size. 4. The image that was inserted into Word, then extracted using the Save As Picture command, is also 300 dpi, but the file size has been reduced to 1.36MB, and the image size is 5.983 x 7.98 inches. The Save as Picture version is smaller in image size and file size, but the resolution remains the same. This method retains the high resolution, but it reduces the file and image size. If you need to extract the image at its original size, you’ll have to try another method. 1. Insert the original 6.85MB image into a new, blank document. 2. Select File > Save As. Under Save As Type, choose Web Page (*.htm; *.html). Do NOT choose Web Page, Filterer (*.htm; *.html). The filtered option exports the images in low resolution. The Web Page option exports the original images, as well as thumbnails. Make sure you save the .docx file as a Web Page, not Web Page Filtered, or you’ll lose even more image quality. 3. 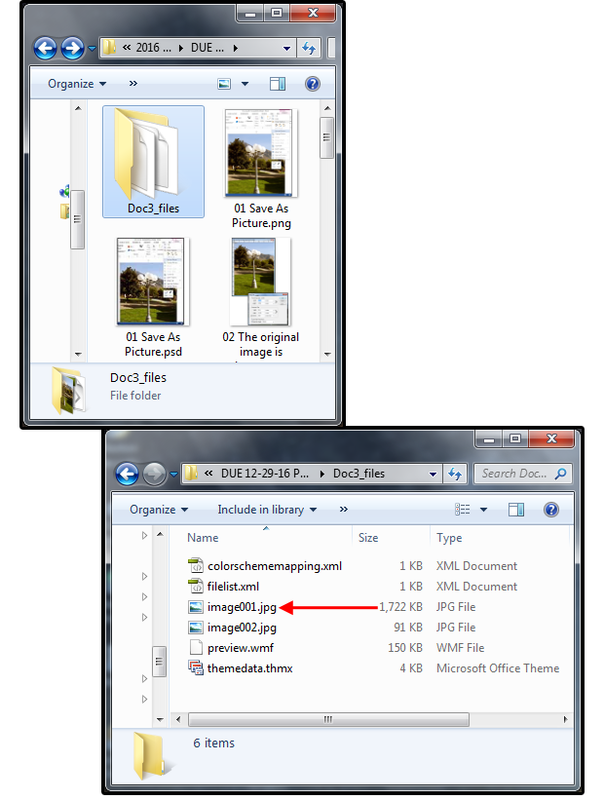 Notice that the system saves the webpage in its own folder (e.g., Doc3_Files). Open the folder to reveal all the webpage files. 4. Image001.jpg is the Lamp Post photo, and Image002.jpg is a thumbnail of the same photo. 5. Notice that the image file is only 1,722KB. The Web Page folder contains all the files necessary to create a webpage, including the image you want. 6. The actual image size is for this webpage graphic is 5.983 x 7.98 inches. The version derived from the Web Page data is smaller in image and file size. Because Microsoft Word’s .docx documents are already zipped files, you can just rename them with the .zip file extension to extract an image or other elements. Note that this procedure does not work with most other file formats. 1. After you insert the original 6.85MB image, save the file as DocAsZip.docx. Next, rename the file from DocAsZip.docx to DocAsZip.zip. 2. 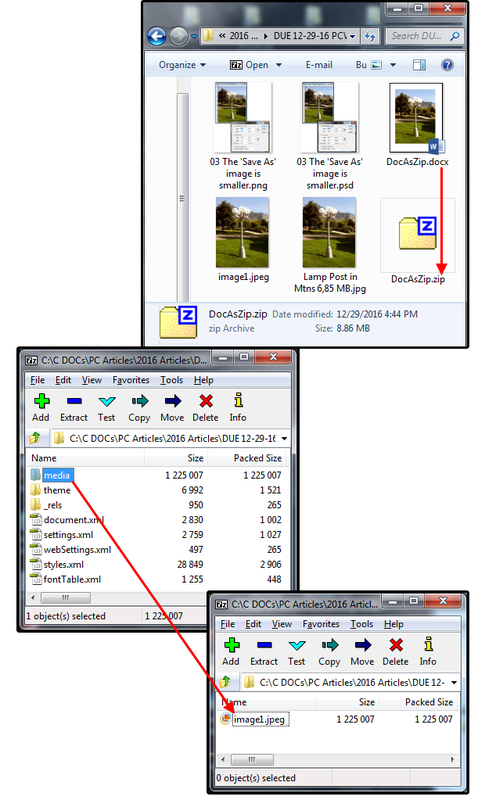 Double-click the DocAsZip.zip file to open it, revealing all the folders, subfolders, and files that are zipped together into this one file. If you rename your .docx file as a .zip file, you can extract the image—but it’s still not the original. 3. Click the Media folder. The image.jpg (in this folder) is the extracted Lamp Post. Notice the file size is 2.43MB—larger than the file size of the image using the Save As Picture method—but the image size is smaller: just 4.763 x 6.35 inches. The resolution remains 300 dpi. The version extracted from the .zip file is smaller in file and image size than the original, but its file size is bigger than what other methods derive. This method retains the high-resolution dots per inch, but it further reduces the file and image size. For images at original size, you’ll have to try another method. 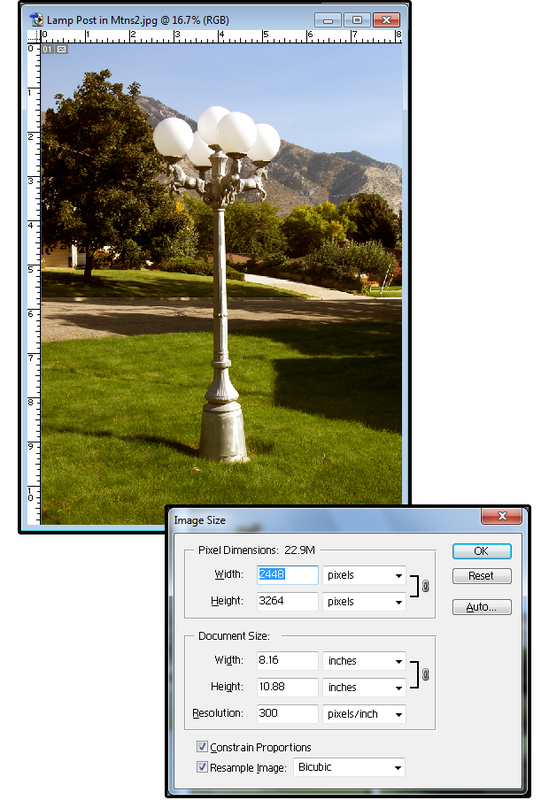 The original Lamp Post file is 6.85MB and 300 dpi, with an actual image size of 8.16 x 10.88 inches. 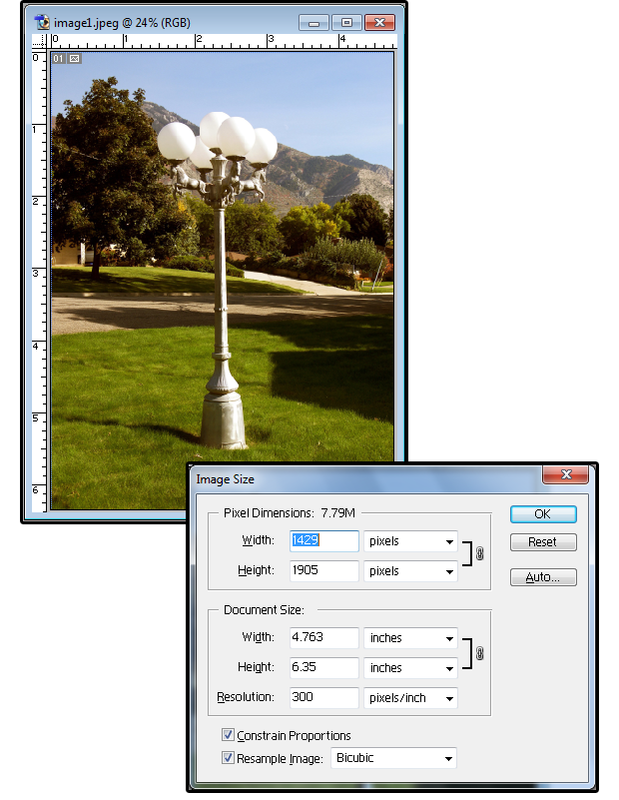 The Save As Picture Lamp Post is also 300 dpi, but the image size is reduced to 5.983 x 7.98 inches, and the file size 1.36MB. 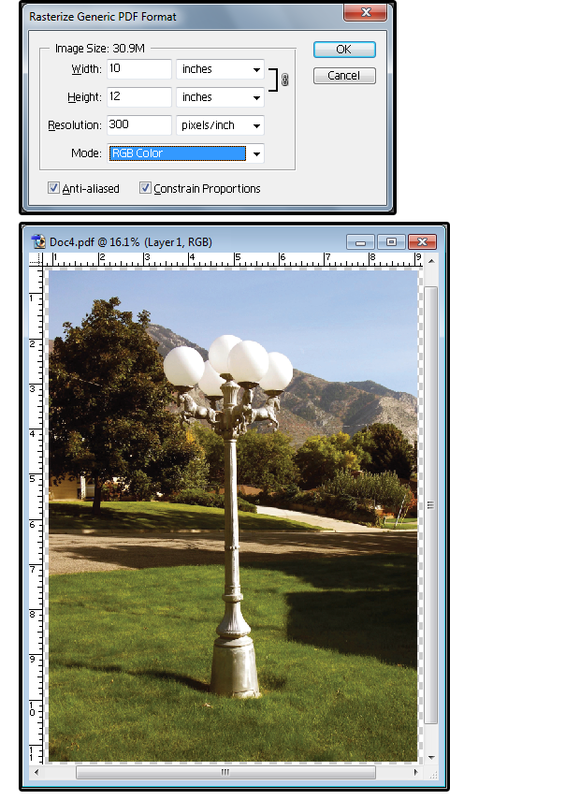 The Web Page Lamp Post picture is 300 dpi and 5.983 x 7.98 inches, but the file size is smaller—1,722KB. Finally, the Zip file (also 300 dpi), which is the smallest of the three with an image size of 4.763 x 6.35 inches, has the largest file size (other than the original) at 2.43MB. The Zip file may be the smallest image size, but the file size indicates that it’s a better-quality image. Remember that .JPG files use a “lossy” compression algorithm, which means image quality is lost during the compression process. This means every time the file is altered or resized and then re-saved, the image degrades. That’s why the different extraction processes mentioned above produce such different results. The copy-paste process produces the worst results. I only mention it so you won’t use it. There’s no trick to this one. 1. Click the Lamp Post image. Press Ctrl+C for Copy. 2. Open a graphics program and press Ctrl+V for Paste. 3. Note what happens to the pasted image. 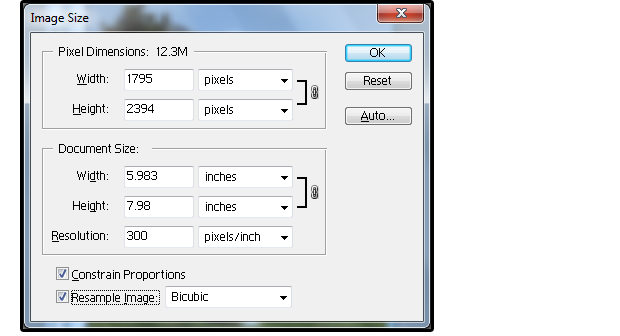 At 300dpi, the image size is reduced to 2.08 x 2.773 inches, and the file size is a measly 586KB. The copied and pasted image is reduced to the size of a wallet photo. And finally, the best option, which uses Export to PDF. It works so well because the PDF format is universal. It's compatible with almost every other format, and it’s extremely flexible. 1. First, make the page size in your Word Document an inch or more larger (on all sides) than the imported/inserted photo (if you’re creating the document with the image). 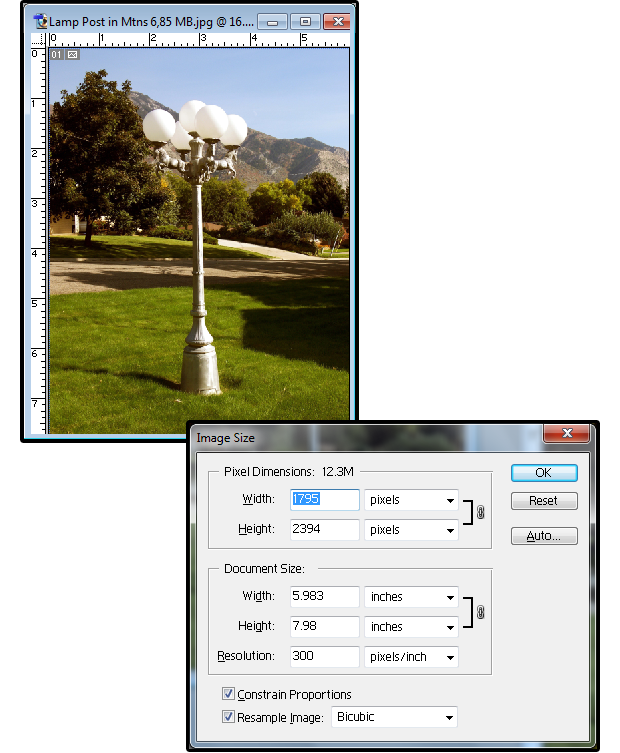 For example, for an 8 x 10-inch photo, make the document size 9 x 11-inch or 10 x 12-inch. Next, set the margins to .5 on all sides. Note: If you are the recipient of the document with the embedded images, then ignore this first step. 2. 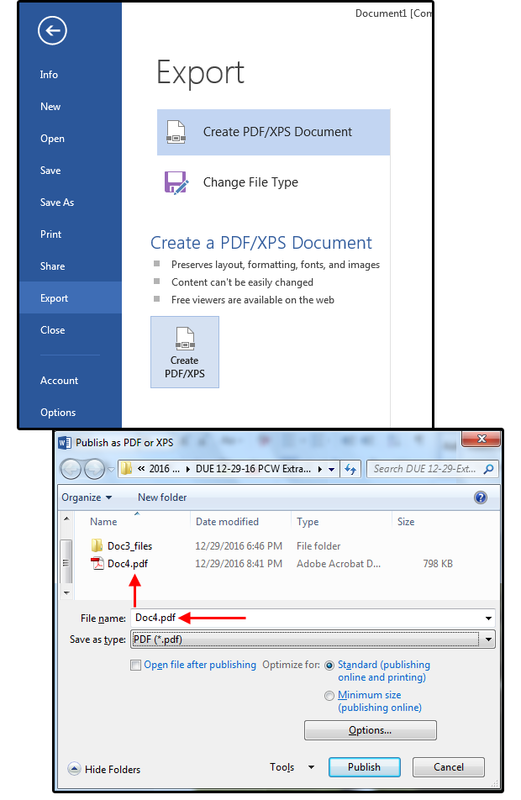 Select File > Export > Create PDF and click the Create PDF button. 3. Word supplies a filename, or you can choose a different one. After you enter the filename, click the Publish button. 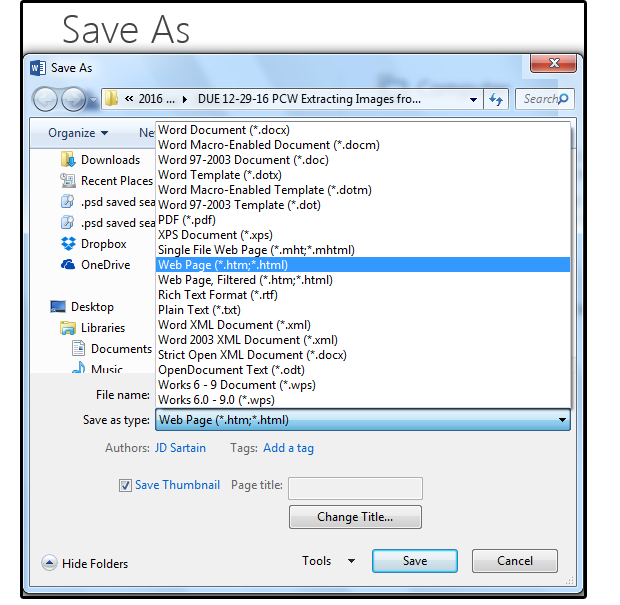 Export the Word file to PDF for better image results. 4. Now open the PDF file in a graphics program such as Adobe Photoshop, Corel PaintShop Pro, Corel Paint, or even Microsoft Paint. 5. After you select File > Open and choose the PDF file, most programs (like Photoshop) display a dialog showing the file image size (30.9MB), the width (10 inches) and height (12 inches), the resolution (300 pixels/inch), the mode (RGB Color), and other info. The exported PDF is the closest in size and resolution to the original. 6. Generally, the pixels-per-inch defaults to whatever it was on the last file opened. Regardless of what this setting says, change it to 300. Also, change the Mode to RGB color, which creates smaller file sizes than CMYK. RGB (red, green, blue) is the color mode for photographs and webpages. CMYK (cyan, magenta, yellow, black) is the color mode for printers (professional and desktop). 7. And last, re-save the file in one of the graphic formats offered by your graphics or photo editing software.